Experience a once-in-a-lifetime event and entertainment at the Grand Canyon Western Ranch in Arizona! Grand Canyon Western Ranch provides endless possibilities for exciting experiences, from horse riding to buffalo viewing in their natural habitat. The ranch also has 50 quarter and draught horses to draw on for wagon rides, all managed by a team of experienced wranglers to ensure your safety during the activity. If you are simply looking for a genuine Wild West escape, Grand Canyon Western Ranch offers what exactly you are looking for. All cabins have spectacular views of the Spirit Mountain. They are detached, each one custom built, have beautiful woodwork interiors, porches all with spectacular views, and containing authentic Western artifacts such as saddles and wagon wheels. Daily maid service is included. The Grand Canyon Western Ranch is nestled in Grapevine Canyon between the Music mountains and the southern end of the Grand Wash Cliffs, 15 miles from the west rim of the Grand Canyon. The water comes from an artisan spring called Grass Springs. The Stone Cabins date back to the 1880’s built by miners who were processing gold ore. They ended their operations here when the Hualapai held their very first Ghost Dance in 1889. The ranch was surrounded by beautiful and scenic views and the Starkey family moved into the Stone Cabin after the miners had left. The main ranch house was built in 1931 by Tap Duncan who acquired the ranch from the Starkey’s. It became the original headquarters of his 1.4 million acre cattle ranch then known as the Diamond Bar Ranch. In order to acquire 1.4 million acres, some folks still wonder how he came by that money. Some say honestly through hard work whilst others say from Bank and Train robberies. Tap’s wife had an uncle named Black Jack Ketchum and he and Harvey Logan (known as Kid Currie) were a notorious bank and train robbers and associated with the Hole in the Wall Gang. Whilst Tap may have been guilty by association one thing is known for sure that Tap participated in a gun battle and killed a man in Bruneau, Idaho. In 1956, the ranch was bought by Dale Smith who was a World Champion Calf Roper in rodeo. At that time, the ranch only operated as a cattle and horse ranch until it was purchased by the present owner's predecessor in 2002 and converted to tourism whilst operating on a smaller scale as a horse and cattle ranch. The new and present operations include helicopter rides into the Grand Canyon, horseback and wagon rides, and a gun range. Buffalos were also introduced to the ranch to revive their past and future history. The main ranch house was converted to a restaurant offering breakfast, lunch, and dinner, a bar which is fully licensed, and accommodations were added. Today, the ranch offers rustic cabins, glamping tents, and an overnight campsite for those wanting to take a horseback trail ride, sleep under the stars, and enjoy a meal cooked by a real cowboy. Only at Grand Canyon Western Ranch, you experience a guided horseback and buffalo safari. This is a once-in-a-lifetime opportunity to ride on a Western horse and see the icon of the West, the buffalo, roaming in its natural environment. All the horse rides are designed for beginners; the horses are gentle and well-trained and suitable for all ages (nine years old and above). Comfortably seated in your authentic Western saddle, you will follow your guide through the Joshua Trees lining the historic Mormon Trail and up to Buffalo Point. You will have the opportunity to photograph the wild buffalo and panoramic views of Spirit and Iron Mountain. Climb aboard a covered wagon drawn by two beautiful Belgian draft horses and go back in time as you follow the old Mormon trail like the pioneers did long ago. As you climb through the Joshua Tree Forest, your cowboy guide will fascinate you with tales of the history and wildlife of this historic ranch. On your arrival at Buffalo Point, you will be in awe as you get your first view of the majestic icon of the West, the buffalo. Having the opportunity to see these animals that used to roam the plains and hear the story about their near extinction is an experience of the West definitely not to miss. From over seventy million animals to under three hundred in 25 years is a near extinction story as important to share with your family as the story of the whales. This historic guest ranch is just a two-hour drive from Las Vegas or six hours from Phoenix, USA. Surrounded by 165 square miles of beautiful Western country, it is the ultimate private retreat. There are no distractions or interference from the outside world. Because Grand Canyon Western Ranch has the only natural springs in the area and being in the lee of majestic Spirit Mountain, the location has been a popular meeting place for thousands of years by multiple ethnic groups who would host special meetings and ceremonies. It was, and still is, sacred ground to the native American Indians where human artifacts and roasting pits found here at the ranch date back 4,000 years. Located five miles from the West Rim of the Grand Canyon, with 165 square miles of land to explore, the possibilities for outdoor adventure at the Historic Grand Canyon Western Ranch are limitless. The ranch is beautiful to visit at any season. It is the ideal location to escape the heat of Las Vegas during the summer and in the winter, the climate is similar to Palm Springs with warm days and campfires at night, cowboy songs sung around the campfire, and a canopy of stars overhead so close, you could reach out and nearly touch them. An outpost of the Old West, the ranch is an ideal retreat for Christmas and the New Year. During this vacation, you will be served breakfast, lunch, and dinner. Experience the old-fashioned hospitality at Grand Canyon Western Ranch where you can enjoy the authentic Western home-style cooking served in the historic ranch house. Sit back and relax while surrounded by the glow of an open fire and candlelit tables and the charm of old-fashioned hospitality. After your meal, you can sit back, relax, and enjoy live cowboy entertainment in the famous "Diamond Bar" serving beer, wine, and all your favorite cocktails. With the opening of the Hoover Dam bypass bridge, the ranch is a short two-hour drive. Follow US 93S toward Hoover Dam. Continue past the dam for about 45 miles to Pierce Ferry Road. Turn left on Pierce Ferry Road toward Dolan Springs and continue through Dolan Springs. Continue for 29 miles to Diamond Bar Road. Turn right on Diamond Bar Road and continue for 5.4 miles until you reach an unpaved road. Continue one mile further on an unpaved road, on your right is Grand Canyon Western Ranch Gate Entrance. The last mile of the road like many ranches is not paved but a good surface. The journey takes approximately 1 hour and 10 minutes. Follow north on US 93. Continue for about 28.5 miles to Pierce Ferry Road. Turn right onto Pierce Ferry Road. Turn right onto Diamond Bar Road and continue on for six miles. Airport: McCarran International Airport Airport transfer included: McCarran International Airport No additional charges. You can request this in the next step. 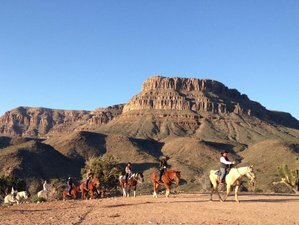 Grand Canyon Western Ranch is the only working cattle ranch close to Las Vegas that offers various kinds of outdoor adventure in Grand Canyon.